In this documentation, we will briefly guide you on how to use ConverseKit on your site. ConverseKit icon will be default positioned bottom-left. 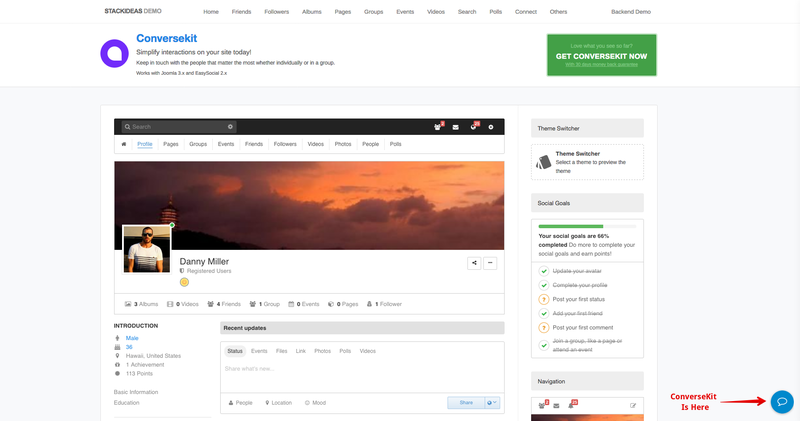 The following screenshot illustrate the position of ConverseKit on the site. A slick popup will be appeared from the right after you have clicked on the ConverseKit button. If you're first time here, you will be presented by this screen as shown below. Click on the Contacts tab at the bottom to start a conversation. Your friends list will be appeared on the next screen as illustrated below. Choose any friend listed here and you may start converse with them. If you haven't have a friend yet, please do add some friends from EasySocial Member's page. Click on any user listed there and start composing your conversation. That is all for this documentation. You may explore more and experience the awesomeness of ConverseKit.